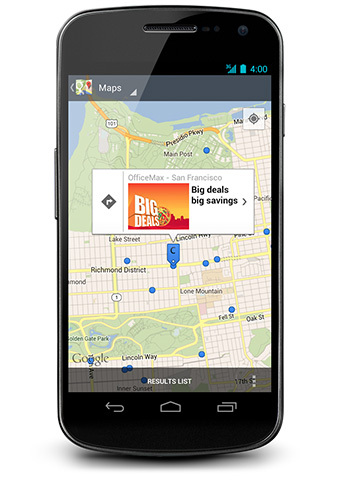 Today, we're rolling out a new way for retailers to reach shoppers at the moment of interest. Retailers can now add promotions to their product listings on Google Shopping to make them stand out. In addition, they can distribute their promotions on other Google properties such as Google Maps for Android and the Google Offers app, and attract shoppers to their store. ﻿In a few simple steps retailers can create a promotions list, map it to the right products in Google Shopping and upload to Google Merchant Center. Our system supports user specific redemption codes and associated reporting, enabling retailers to measure the performance of each promotion. ﻿This is one of the many steps we’re taking to provide traffic, technology and tools to help retailers grow their business. Over 25 well-known U.S. retailers, including 1-800-flowers.com, OfficeMax®, Inc., Tommy Hilfiger, Express, Chico’s, Overstock, Guitar Center, Drugstore.com and Wayfair, are already part of this program. In the coming months, we plan to expand the program to include more retailers. If you are interested in featuring your promotions on Google properties, you can learn more here. Shoppers are savvier than ever. They use social recommendations, web searches and smartphone apps to make informed purchase decisions. So how can a retailer stand out and get a shopper’s attention?